Fracking is a controversial process of forcing the ground open in order to extract gas and oil. The process has had its deserved amount of critique because of the environmental hazards it poses and how such rather desperate means of fossil energy extraction are continuing the wider CO2-heavy era of technological culture. But what is virtual, or photographic, fracking? In Grayson Cooke’s art project, Cooke replicates the idea of using chemicals to fracture and stimulate the earth to open it up but with a focus on photographic materials. The chemistry of media he engages with uses hydrochloric acid, acetic acid, and sodium hydroxide to “frack” the images of Australian sandstone and shale rock. The image is not a representation, nor an allegory, so much as a doubling of the violent geological process. 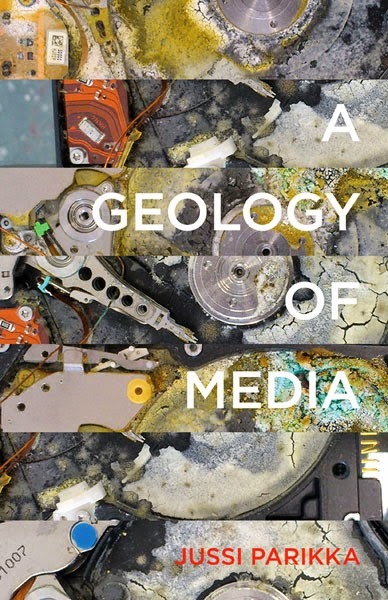 Cooke’s project is a fantastic way to introduce the central idea behind A Geology of Media. The book argues that in order to understand the materiality of media in the age of advanced technologies, we need to also look beyond the actual media devices. On the one hand, this can mean to address the wider infrastructures in which apparatuses are functional – communication enabled by cables, masts, power plants and also the logistics that catalyse the delivery of our energy and materials. And on the other hand, indeed the materials that support the existence of media as media: rare earths and other materials used in casings, cables, wirings, motherboards, etc. The book comes with a provocation: What if media history is not merely the couple of thousands of years of media devices and techniques for and by humans, or our use practices and political economy – but also conditioned by planetary durations? We nowadays speak increasingly of the massive scales of planetary design and ideas of planetary computation; this idea is bootstrapped by the fact that earth materialities enable the existence of media. Besides the crucial need for empirical and globally widespread research with innovative methods that can feed into more progressive policies and environmental actions, which can range from the local to the planetary, theoretical writing can speak to these themes, too. Contextualising its message in media theory, environmental humanities, and the work on cultural theory of materiality, A Geology of Media is the third part of a book trilogy on media ecologies, inspired originally by the work of Matthew Fuller, as well as German media theory; writings by Sean Cubitt and Jennifer Gabrys; and many other scholars. It continues the earlier books on viral, contagious digital culture (Digital Contagions, 2007) and media archaeology of animals (Insect Media, 2010), but with an even stronger environmental focus. The need to think of geology not merely as a conceptual shift in theoretical discussions, but also as something that touches on environmental themes is a necessity mobilized in this book. “The Anthropocene” is only one recent term—an influential one for sure—that is an attempt to address the chemical-technological world of interlocked economic, ecological, political, and social forces. Hence, A Geology of Media is a way to understand this bind in media-specific terms, too, while acknowledging that the environment opens up to the discussions concerning our economic practices, works through neo-colonial ties between the Global North and the Global South, and is constantly distributed in most uneven ways. Like the example we started with, Cooke’s art project, it is often in contemporary design and media arts that we find an audiovisual expression of this complex ecological situation. Contemporary art, from The Otolith Group to The Crystal World project (Martin Howse, Jonathan Kemp, and Ryan Jordan), to the work of Katie Paterson, to Critical Infrastructure by Jamie Allen and David Gauthier, provides examples of art that is embedded in thinking about the geological. More recent projects, such as Abelardo G. Fournier’s Mineral Vision, have addressed the connection of materials like copper and digital computation and vision systems. Indeed, we need to be aware that design and art projects are well-positioned to articulate this situation; it’s a mode of knowledge that works in and through art methods as methods of ecology; of working in and with the materials that constitute the technological culture even if often in precarious, sometimes even toxic, ways. Dr. Jussi Parikka is Professor in technological culture and aesthetics at University of Southampton, Winchester School of Art. He is also Docent in Digital Culture Theory at University of Turku, Finland and the author and editor of various books on media, arts and communication, including A Geology of Media. He blogs at Machinology. 25 years of Hubble images from space: strange, alien, phenomenal—and yet somehow, familiar. been a common subject for painters such as Thomas Moran. On April 24, 1990, NASA launched the Hubble Space Telescope into its orbit above Earth. During its 25 years in space, astronomers have used Hubble data to develop vividly colored, highly resolved, and carefully composed pictures of nebulae, galaxies, and star fields. These sublime pictures now define how we see and imagine the universe. To celebrate Hubble’s years of observing the cosmos, NASA has added a new image to the telescope’s gallery. The picture centers on Westerlund 2, a giant star cluster located in the constellation Carina, and it exhibits many of the characteristics made familiar by earlier Hubble images. This is not a universe in stark black and white, but the heavens on display in a full spectrum of vibrant hues—blues, reds, and purples. The sharply resolved details of the nebula give a sense of mass and volume to the pillars of gas and dust that reach out of its curving form. In the foreground, the gaseous clouds are dark, but they brighten as they recede into the distance. The change in contrast gives the picture depth. It invites us to explore the vastness and complexity of the nebula, to travel through what NASA’s press release describes as “a fantasy landscape of pillars, ridges, and valleys.” As with many other Hubble images, it’s a picture that evokes an experience of awe and wonder. Many of the best-known Hubble images encourage this kind of response through a resemblance to landscape paintings and photographs of the American West. 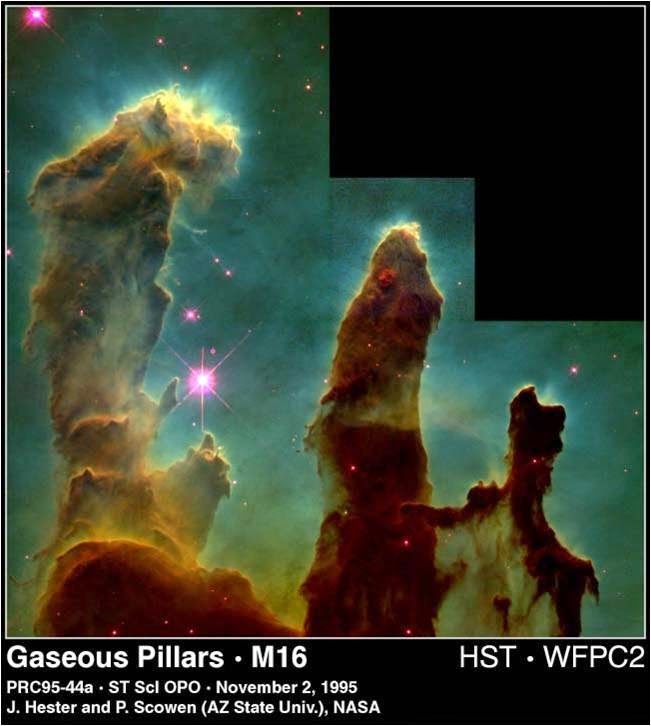 For example, the Hubble’s famous picture of a small region of the Eagle Nebula, often called the “Pillars of Creation,” orients the scene so the towers reach toward the top of the frame. The dramatic light that shines from behind pulls our eyes upward, further emphasizing the verticality and monumentality of the forms. It brings to mind the rocky towers that are icons of the American West, and a common subject for painters and photographers such as Thomas Moran, William Henry Jackson, and Timothy O’Sullivan. The color scheme chosen by astronomers who crafted the image lend support to the analogy. The hues map the relative wavelengths as registered through different filters on the Hubble’s camera, but it also means that we see towers of yellow, red, and brown with a blue-green sky in the background. In sum, the astronomers who translated the Hubble data into a picture carefully balanced the need for a scientifically valid image with the desire for aesthetically compelling one. The similarity to the American landscapes encourages a particular response. The images show us strange and alien scenes, and they remind us about the vast size and scale of the cosmos and the celestial objects within it. But they also look familiar. They look like places that we could imagine visiting. Despite the invitation, the Eagle Nebula and Westerlund 2 are too far away for humans or even our space probes to reach. They depict a frontier that we can only cross in our imaginations, or in a figurative sense, as astronomers learn more about the physical process at work in the universe. Most of the time, astronomers and image processors at NASA and the Space Telescope Science Institute (the research center charged with the management of the telescope) have left it to our imaginations to take us over that frontier. (Movie fan—whether science fiction buffs or IMAX enthusiasts—have experienced a few fly-throughs based on Hubble’s images of nebulae and galaxies.) But with the 25th anniversary, we don’t have to rely on our imaginations or wait for the movie version. In addition to the still image, NASA and STScI have also developed and released animations that begin with a view of the night sky as seen from earth, travel to the location of Westerlund 2 and its surrounding nebula, and then into its sweeping cloud formations. For just a few moments, we float above that fantasy landscape before looking up the tightly clustered stars that the press release likens to a fireworks display. It’s the fulfillment of the invitation issued by older Hubble images. Instead of stopping at the frontier of the image, we cross over it and indulge our senses with the spectacular scenery. It’s a thrillingly perspective, and it’s only too tempting to forget that we only see like this courtesy of the Hubble Space Telescope and those who translate its data into such sublime views. 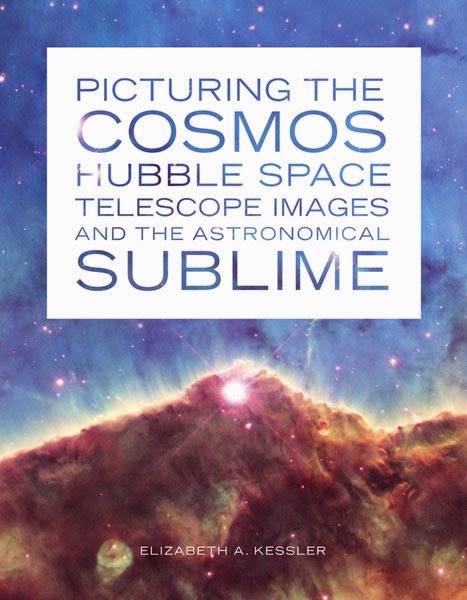 Elizabeth A. Kessler is author of Picturing the Cosmos: Hubble Space Telescope Images and the Astronomical Sublime. She teaches at Stanford University. She has been awarded fellowships by the Smithsonian Institution National Air and Space Museum and Stanford University. Now, more than ever, the singularities of world history—whether imagined as a Hegelian “end of history” via the universalization of liberal democracy, a utopian fulfillment of the dream of total market capitalism, the consolidation of realpolitikal fault lines dividing economic orders or social regimes, or as the production of a single worldwide Weltanschauung via some combination of media consolidation and the internet, each of which has been called “globalization”—require us to understand the past, the present, and the futures of Asia. The immediate reasons for doing so are clear: the increasing influence, economic and political, of the new Asian superpowers, China and India; the alternative systems of human rights emerging from the “Asian values” debate; Asia’s role as the socio-cultural vanguard of global futures and global geographies, captured in the techno-Orientalist imaginaries of films like Blade Runner, The Matrix, and The Ghost in the Shell, or in scholarly analyses of the postmodern, cosmopolitan megacity; the possibility that among the first victims of global warming will be the Republic of Kiribati, two of whose islands disappeared underwater in 1999; the still-emerging political effects of powerful transnational communities of “flexible citizens” in Singapore, Taiwan, or India; and, finally, the growing global influence of diasporic communities of Asians abroad—in the United States, in Europe, in Africa, in Australia, and of course elsewhere in Asia itself. And yet the belated “arrival” of Asia on the shores of the global present obscures, if we allow it, the fact that Asia has been present in the world-making project of history and human life from the very beginning. We may want to say that the “rise” of Europe made that longer history difficult to see, or attribute the epistemological limitations of twentieth-century historiography to an effect of power-knowledge structures that derive from critical kinds of conceptual divergence. Nonetheless, we must now recognize that the kinds of “world” historical claims made for the twentieth century (or even the sixteenth) relied for their force on a very particular theory of what made history “worldly.” Restoring a long view to the history of Asia’s place in and as the world in order to better understand and shape how we think about the present is one of the most pressing tasks for serious humanistic work about world-systems and the imaginative geographies they simultaneously enact and exemplify. At the same time, we must recognize that the world built out of the putative European “divergence” from Asia can be characterized equally well by a series of subsequent convergences, a mixing together of ideas, people, and things that has left untouched no corner of the planet. “Globalization” is, in fact, one name for this converging impulse, which seems at times to emerge as much from universal history itself as from any personal impulse to connect, to transact, or to travel. To think globalization today is thus to think a pattern: divergence, then convergence … and then, beyond a certain limit … divergence again? No one knows. But it is our job to speculate, and to learn as much as we can from the example of the past, which has the advantage of being what we can know and the disadvantage of being always a bit, or more, unlike the presents and futures that face us. Much of this work on transnationalism has, paradoxically, highlighted the continued relevance of the nation-state to the formation of culture, the practice of history, and to the realm of international affairs. There is no transnationalism without the nation. Here the history of scholarship on Asian America, when juxtaposed with the fields of Asian Studies, reminds us how much nations, national movements, and other forms of national development continue to exert powerful effects on the world in which we live. Such movements also remind us of the importance of inter-nationalism, of the kinds of networks that can spring up between states and which can work to disrupt the smooth passage of the planet into a utopian post-national future. We should make clear at this juncture that Asian American Studies stands in for a broader commitment to studying Asian influence—the migration of people, things, and ideas from the region we call “Asia” today, or recognized as Asian in any given historical context—as globally as possible. 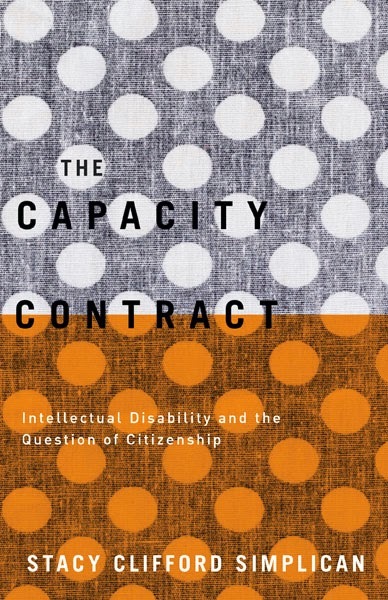 We conceive of its inclusion as a starting point for inclusiveness, rather than a limit to it. The growing interest in the global and the transnational across disciplines thus brings the various Asia-oriented fields and disciplines—history and literature, Asia and Asian America, East and South, modern and premodern—closer together. Verge aims to occupy and enlarge that proximity. Verge’s project emphasizes doubly decentered scholarship and what emerges is a new kind of materialist history: a history that shows how the ideas at stake in traditionally centered forms of scholarship emerge through and shape the material activities that act as their ground. This decentered approach has made it possible today to imagine a journal that includes scholarship from scholars in both Asian and Asian American Studies. These two fields have traditionally defined themselves in opposition to one another, the former focused on an area-studies, nationally and politically oriented approach, the latter emphasizing epistemological categories, including ethnicity and citizenship, that draw mainly on the history of the United States. The past decade has seen a series of rapprochements in which, for instance, categories “belonging” to Asian American Studies (ethnicity, race, diaspora) have been applied with increasing success to studies of Asia. For example, Asian Studies has responded to the postnational turn in the humanities and social sciences by becoming increasingly open to rethinking its national and regional insularities, and to work that pushes, often literally, on the boundaries of Asia as both a place and a concept. At the same time, Asian American Studies has become increasingly aware of the ongoing importance of Asia to the Asian American experience, and thus more open to work that is transnational or multilingual, as well as to forms of scholarship that challenge the US-centrism of concepts governing the Asian diaspora. More generally, one might say that the historically awkward split whereby the study of immigrants from Asia was relegated to a variety of national studies, most prominently Asian American, while the “home” countries of those same immigrants were studied under the area studies model, has produced a model of “uneven” or differential development, in which the conceptual categories used to study one group of people (such as ethnicity, citizenship, labor, in the case of Asian American Studies) have been quite different than those used to study the ancestors or relatives of that same group (community, urbanization, trade). Bringing the two disciplinary fields together thus allows us to cross-pollinate the categories of analysis, asking, for instance, how a concept like the nomad, so important in a variety of Asian Studies fields, might usefully be applied to Asian American populations, and to ask, in turn, if the evidence from the Asian American example can usefully shape the concept of the nomadic as an evolving mode of social being (in a radically different historical context). The experiment here is therefore not to produce a superficial convergence of interest in Asia (or to ratify some ethnic commonality to a new version of “Asian” history). Verge responds, rather, to the enormous recent growth in scholarship that asks how Asian immigrants around the world have served as conduits for a variety of Asian concepts, objects, or forms of social life (perhaps most obviously in terms of food), and as vectors for economic and cultural transactions directed from their new homes back to their old ones, in ways that substantively affect the history of Asia—and vice versa. And we turn, via our observation of the effects of this historically local series of happenings on our own contemporary societies, to a variety of questions involving the production of the global, or of world-systems, that extend all the way back to the earliest moments of human history. “Asia” has been “global” since long before the diasporas of the nineteenth century; the question is how, and why, and what kinds of forms—social, cultural, and historical—have consolidated themselves around the various forms of locality and worldliness that characterize any dynamic culture. We therefore invite work that showcases the intersection between Asia and the globe—these two concepts vibrating, to be sure, between their purely fictional meanings, and their most ordinary, commonsensical ones—that considers the interaction of cultures from the earliest beginnings of human civilization, and that remembers that if we consider plant or animal life, the transactions go back well beyond that blessed beginning. If we are to recognize the importance of flow and movement as factors in the production of world history, we cannot restrict the study of Asia to any fixed geographic region of the planet, any historical period, or even, if we take Naoki Sakai’s suggestion that “we should use the word Asian in such a way as to emphasize the fluidity of the very distinction between the West and Asia rather than its persistence” seriously, any specific cultural or biologically constituted population. “Asia” happens anytime, everywhere, and applies to everyone: Verge studies it as a global concept. 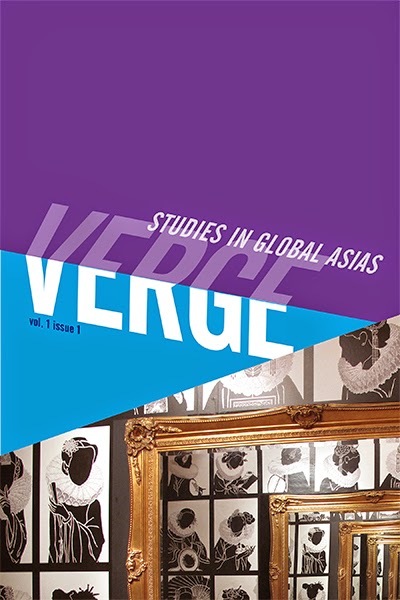 Tina Chen and Eric Hayot are editors of Verge: Studies in Global Asias, a journal that showcases scholarship on “Asian” topics from across the humanities and humanistic social sciences, while recognizing that the changing scope of “Asia” as a concept and method is today an object of vital critical concern. California's Mono Lake, pictured in August 2014. 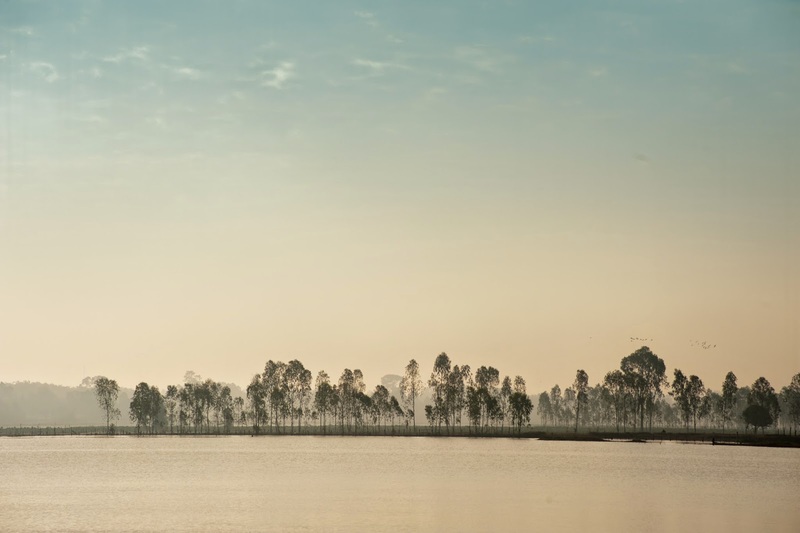 The solution to California’s drought is simple: stop shipping water to China. Farmers, who use 80% of the state’s water, ship crops containing “virtual water” (the water used to grow these crops) to places like China, Afghanistan, and Turkey. Stopping these exports would save six trillion gallons of water per day—enough to solve the problem in the short run. In fact, California could shut down farming altogether and still be fine, since agribusiness only supplies 2% of the state's GDP. But in the long run, as I told my mother, it is time to think about moving out of California. Luckily, my mom followed my advice, packed up her house in California, and moved to Seattle, where water is cheap and plentiful . . . at least until Californians come for it, which is everyone’s fear north of the border. California is the world’s guinea pig, since it was the first in the world to construct massive concrete water transfer systems, beginning with the Los Angeles Aqueduct in 1913. These systems have a natural lifespan, yet California was built on the fallacy that indefinite, inexhaustible growth was possible by moving water around like so many chess pieces. Back then, the idea was that you could drain swamps, irrigate, and otherwise spread water evenly across California to create the Jeffersonian dream of small farmers. Today, California’s water politics are like a giant chess game in which everyone is losing—yet no one will stop playing because they’ve been playing so long. I always tell people to watch California to see the consequences of modern water conveyance systems. California destroyed 90% of its wetlands. Its dams silted up and are some are being taken down. The west side of Central Valley is becoming a salt-covered desert. (Just drive down “Alkali Street” at the Tachi-Yokut reservation, and you will see what I mean.) Two regions have become toxic dust bowls, and the state is frantically trying to figure out how to fix these problems. Today, I use California as an example of what not to do. Throw climate change in the mix, and you have a major disaster. Currently, the Sierra Nevada mountains have only received 6% of their average snowpack, which has never happened before in recorded history. Governor Jerry Brown has mandated that urban users receive only 75% of their normal water supplies. The extra 69% will come from reservoir storage, groundwater pumping, and the Colorado River. Yet NASA scientists are saying California only has one year worth of stored water left. What will happen the following year? While people complain about being in a four-year drought, the truth is that they should be planning for a 20- or 30-year drought. As the planet heats up, weather patterns change, rocks warm, and snow melts. Today, urban Californians complain (rightly so) that Brown did not cut water for farmers—most likely because they fund his campaigns. So farmers will keep getting their water, based on a complicated and arcane allotment system; many will use that water on wasteful flood irrigation. Others will pump groundwater, which is cracking housing foundations and causing wells to go dry. Californians should not have to suffer health consequences from a lack of running water so a neighboring farmer can sell pistachios to Afghanistan. 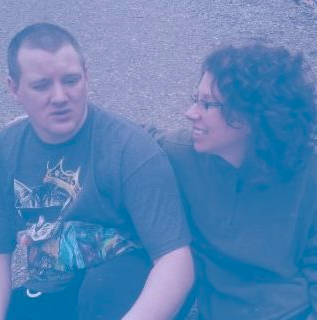 This is an equity and human rights issue, and residents could actually sue the state thanks to a legally enforceable U.N. resolution stating that everyone has the right to an adequate supply of clean water. Some farmers are choosing to sell their water at astronomical prices ($700 to $1,800 an acre-foot) to urban areas, making larger profits than they would from farming. Water markets, which everyone promised would solve the problem, are instead allowing agribusiness to gouge urban consumers and dry up neighbors’ wells. 1) Do not allow farming for export, which essentially exports California’s water. 2) Enforce laws stating that farms should be no more than 960 acres. Farmers have been finding loopholes around these laws since they were enacted. The initial proposal was that a family farm would be 160 acres, which later changed to 960 acres. How we got to 10,000-plus-acre farms is another story. 3) Provide incentives for growing drought-resistant crops and switching to organic, which uses less water and rebuilds soils to allow them to retain more moisture. 4) Provide incentives for permaculture, agroforestry, and agroecology techniques. The World Bank is already doing this in marginal lands around the world, knowing that these methods are less water intensive and rebuild the soil. Permaculture is being deployed in Australia to deal with its drought, and there are plenty of permaculture experts in California who could be enlisted to help. 5) Fertilize with biochar. Biochar is a charcoal-based soil additive used both to fertilize and combat climate change because it captures carbon in the soil. Finally: plan for the worst. Even if we were to stop all carbon emissions today, the planet would still warm another 1.4 degrees Fahrenheit (.8 C) as the ocean releases stored carbon. More importantly, climate change is happening now and no one really knows what “now” will look like anymore. Karen Piper is author of The Price of Thirst: Global Water Inequality and the Coming Chaos, Cartographic Fictions, and Left in the Dust, which the Los Angeles Times has called an “eco-thriller” that every “tap-turning American” should read. A regular contributor to Places magazine, Piper is also a winner of Sierra’s Nature Writing Award and has published in numerous academic journals. She is professor of postcolonial studies in English and adjunct professor in geography at the University of Missouri.